The flagship boat in the Bowrider Series, the 320-horsepower, 23 ft.
SX230 High Output was designed to give the ultimate balance of luxury and performance. 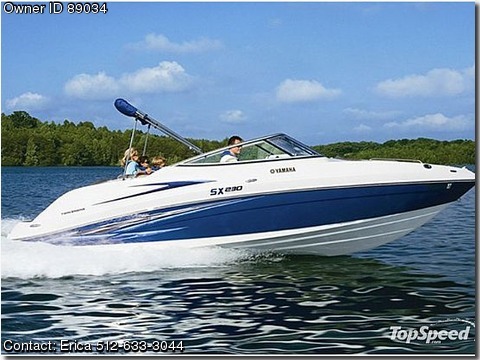 This boat has an unbelievably responsive acceleration and speed. The Yamaha SX230 High Output features makes the ride a real pleasure. The removable plush Marine-grade Carpet adds another touch of luxury to this first class ride. The sun bothers you, no problem, the custom Bimini™ Top provides the needed shade. The enclosed head compartment is a convenient place to change out of the bathing suit into dry clothes.